Summary: Researchers are developing a more accessible means to monitor brain health. Simon Fraser University researchers hope that a brain vital-sign test becomes as routine during a doctor’s check-up as taking a blood pressure or heart rate measurement. SFU researchers, led by professor Ryan D’Arcy with partners from the Mayo Clinic, Sheba Medical Centre in Israel and local high-tech company HealthTech Connex Inc., are developing a more accessible means to monitor brain health. In a recent article published in the journal Frontiers in Neuroscience, the team introduces the world’s first advancement in physiology-based brain vital signs. Their discovery makes it possible to translate complex brainwaves into objective, practical and deployable brain vital signs, using longstanding brainwave technologies that have existed for nearly a century. HealthTech Connex Inc. is currently developing the NeuroCatchTM platform to enable the highest quality recordings of the brain’s vital signs. Vital sign measures are often used in clinics, hospitals and other care centres to assess the performance of various body systems. 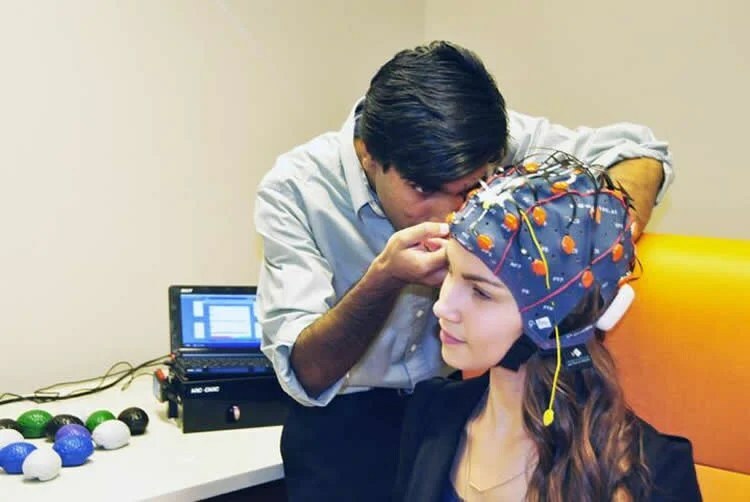 Scientists in D’Arcy’s NeuroTech Lab, based in Surrey Memorial Hospital, have now developed a simple way to measure brain health over time by using non-invasive electrodes to track the brain’s electrical activity for key brain functions–in other words, the brain’s vital signs. Researchers found that it is possible to monitor brain performance during auditory sensation, and basic attention and cognitive processing. Traditionally, brain function has been assessed only after trauma or disease has occurred and has relied heavily on subjective, behaviour-based assessments. “However, tracking our brain’s vital signs is critically important for establishing a baseline for a person’s objective brain activity,” he adds, noting that in the event of injury or disease, it then becomes possible to evaluate if brain function changes, and whether treatments are effective. “We describe the world’s first physiology-driven brain vital-sign measure allowing us to quantify brain vitality over time,” says Sujoy Ghosh Hajra, A PhD student working with D’Arcy and the paper’s lead author. The brain vital signs platform works with any brainwave devices. Credit: Marianne Meadahl, SFU. In the paper, researchers describe how their framework translates complex brainwave science into clinically accessible information and demonstrates successful measurement of brain vital signs in both younger and older adults. Their method identified age-related brain function changes that were not evident using traditional measures. The paper has had significant hits–more than 1,000 views globally–which Ghosh Hajra says is a testament to the urgent need to quantify brain vitality. Funding: This work was supported in part by Mathematics of Information Technology and Complex Systems (MITACS, Grant #IT03240), National Sciences and Engineering Council Canada (NSERC, Grant #298457-2009), and Canadian Institutes for Health Research (CIHR, Grant #CCI-109608). Conflict of Interest: Several of the authors are associated with HealthTech Connex Inc. which may qualify them to financially benefit from the commercialization of a NeuroCatch™ platform capable of measuring brain vital signs. Image Source: This NeuroscienceNews.com image is credited to Marianne Meadahl, SFU. Simon Fraser University. “Could Brainwaves Be the Next Health Vital Sign?.” NeuroscienceNews. NeuroscienceNews, 2 June 2026. Simon Fraser University. “Could Brainwaves Be the Next Health Vital Sign?.” http://neurosciencenews.com/brainwaves-health-neuroscience-4358/ (accessed June 2, 2026).